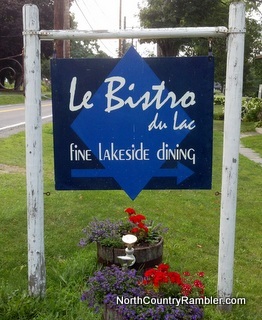 Le Bistro du Lac’s seasonal opening each summer is an eagerly anticipated Adirondack event. Like farmer’s markets and county fairs, many of our favorite Adirondack dining destinations are only open for a few months – appearing briefly, like Brigadoon, each year. For us a trip to Bistro du Lac is almost always accompanied by a show at the nearby Depot Theater, another wonderful seasonal treat. In my prior post about Le Bistro du Lac I talked about the owners’ seasonal routine. Rosemarie and her husband Bernard run the quintessential Restaurant Français, complete with a nice bistro style inexpensive wine list, and some classic French dishes like escargot, steak tartare, and bouillabaisse. You can view the complete menu here. All of this overlooks a spectacular view of the marina and Lake Champlain, looking east toward the Green Mountains in Vermont. At season’s end, the owners head back to their “winter” restaurant – Chez Henri in Sugarbush, Vermont. Last night we ordered a few of the old standards – starting with a smoked salmon platter ($10), a chilled half lobster ($16), and my personal favorite – beef tartare ($16). This is one of a handful of north country restaurants at which I order tartare. Ordering this classic requires two prerequisites – enough volume to insure very fresh beef, and a skilled pair of hands in the kitchen. Bernard prepares a very nice hand chopped blend of seasoned filet, which comes with some toasted baguette slices for “schmearing”. Even better are the slices of fresh county bread that comes with dinner. I like mine with some extra minced red onion, which the kitchen is always happy to provide. Last night’s specials included sauteed soft shell crab Provencale ($28), which my sisters raved about, and a sirloin steak frites ($26) . I zeroed in on one of Bernard’s best dishes – a classic bouillabaisse ($29.50). There are few (actually no) rascasse (scorpionfish) or sea robins available in the north country, a required ingredient for a truly classic bouillabaisse. The kitchen here substitutes monkfish, (which is almost as ugly as rascasse, and very tasty) along with scallops and shrimp, mussels, and squid. The resulting broth is among the best I’ve tasted. For my money this is the restaurant’s signature dish, and is not to be missed. Save room for dessert – the creme brulee is fist rate – and a cup of espresso. Sitting out by the lake at Le Bistro enjoying Bernard's and Rosemarie's skill and hospitality is not just a delightful dining experience, but a feast for all the senses. Evening light in the golden hour, the sound of the breeze and waves, and the vista all complement a great meal. I have had everything on the menu, loved every dish, and the setting makes each trip there memorable. There are several places I make a point of going to each year, including Le Bistro du Lac: the Deer's Head in Elizabethtown, the Turtle Island Cafe in Willsboro, and the completely redone Westport Hotel with its new chef. I like Westport so much it's almost like we should keep it a secret. Four great chefs in such a rural area make Wesport a great destination. Definitely a must-see restaurant for everyone that visits NY and is looking for great French cuisine and best outdoor dining experience.